We hope you enjoy perusing the galleries of some of the past restorations we have carried out. If you have a restoration project you wish to enquire about please contact us as we can probably help. Our rates are very competitive and our commitment 2nd to none. CAST IRON SIGNPOST This was another accident victim which we were asked to fully restore. The post had been hit, breaking off one arm and its bracket. The lower finial casting was also broken. It had previously been welded to the top finial so could not simply be replaced. The column was loose in the ground and investigation showed that half of the underground part had broken off and the other half was badly cracked and it broke away with little force. We first stripped the whole signpost back to bare metal then designed, fabricated and fitted a new ‘footing’. The broken finial casting was welded-up and it was modified to allow it to be secured to the core-tube as previously it had not been secured at all. New oak finger-arms were made and painted and had new lettering fitted. The signpost castings were painted in the original scheme and after allowing time for the paint to fully harden it was reassembled on-site with the new finger-arms. This cast iron fingerpost sign had been damaged when struck by a turning vehicle. One wooden finger-arm had been snapped off; breaking its mounting bracket and another bracket had been badly cracked. The lower finial had evidently been cracked for some time and simply fell apart when removed. The steel core-tube over which the brackets are mounted was heavily corroded making dismantling difficult. Another restorer was unable to repair it and could only recommend replacing the entire signpost including the intact post itself but using our expertise we were able to superbly repair the signpost at a fraction of the cost. The rusty portion of the core-tube was cut off and a new length welded in place. This allowed the broken bracket to be replaced whilst the cracked bracket and lower finial were both welded-up. The finial which had to be cut from the rusted tube had its threaded rod repaired so that it could be refitted to the new tube. With a new oak finger-arm installed the signpost now looks as good as new and set to survive for several more decades. We recently repaired this damaged cast iron post from an old roadside fingerpost sign. The signpost had been under restoration for some time by another restorer but when the post was hit by a vehicle and snapped off at ground level they informed the local Parish Council that they were unable to repair the post. The below-ground part was broken and unable to be salvaged but, undaunted, we designed and manufactured a replacement `footing`. We also replaced the heavily rusted tube which holds the sign`s finger arms. The post was then cleaned back to bare metal before repainting and installation, ready for new arms to be fitted. This was all achieved at a fraction of the cost of a new post. Shenley Church End Parish Council commissioned us to fully restore their one remaining traditional cast iron fingerpost sign including reinstatement of the missing finial and arm which had been removed some years ago. In addition, each of the arm mounting brackets was cracked and broken into several pieces and poor repairs by a previous company had damaged them further meaning that replacement was now the only viable option. We used our expertise to create the wooden patterns and core-box moulds that are necessary for the new hollow brackets, finial and finger-arm to be cast. The new castings were then machined and finished to a very high standard, as were the existing original castings which were to be retained. The Parish Council and local residents are delighted by the change to their historic signpost. Another telephone kiosk we restored, this time in Hertfordshire. The box was in quite a state and access was a bit difficult with a postbox and bush in close proximity. It is also on a busy road and right by a busy tearoom so we were very careful to minimise disruption and annoyance. Nevertheless we were able to strip the box back to bare metal and carry out a thorough restoration to the delight of locals and Datchworth Museum who funded the restoration. Despite not being part of the conrtract we also `made-good` the failing concrete around the box to improve it`s look and to avoid it being a trip hazzard. We were commissioned to carry out some machining and fabrication work for this recently recast sign post. This postbox came to us in a very poor state. The owner was keen to have the original steel housing repaired rather than replaced. We were able to form repair panels of the correct curvature and weld them in place so that very little filler was required afterwards. This telephone kiosk is a listed building which we completely restored on behalf of the Parish Council to house a defibrillator. The box was sandblasted back to bare metal before being carefully repainted and reglazed. All interior parts were overhauled before refitting and a more traditional style light fitting installed. This rare ‘sprung’ horse from a child’s playground arrived with a broken spring and an incorrect mounting plate. As well as repainting the horse we were able to source a replacement spring, modify the mounting plate and make correct-sized U-bolts for the new spring. Telephone box doors are made of teak and frequently rot along the bottom. We have carried out high quality repairs to several kiosk doors. The Gilbert & Barker petrol pumps of the 1920`s are extremely popular. We have fully restored two of these pumps for customers. We fitted both of them with modern light fittings and brackets of our own design/manufacture to illuminate their glass globes. We have restored several post boxes. Some have been the small `lamp boxes` for fixing to telegraph poles or wooden posts. Another was a `wall box` which we built into a brick pillar. This Victorian pillar box we restored dates from the period 1887 - 1901. We use a 1968 Austin A35 van for much of our work. To enable us to move telephone box doors and other large items we needed to be able to tow a trailer. We therefore had to design and fabricate a towbar. To avoid spoiling the looks of such an iconic van, not only did it need to be strong but we also had to ensure that it was as unobtrusive as possible and required no modifications to the van. The finished item meets all it`s requirements superbly. 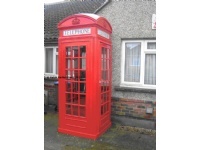 Due to restricted access into a back garden this telephone box had to be taken apart whilst being restored. Although time-consuming to carry out this is a far cheaper alternative than to hire a crane. Using our wealth of experience, by various methods we were able to remove every screw and bolt without damaging any of the threads in the cast iron. This is in sharp contrast to a couple of other examples we have seen where people have simply drilled out every single bolt then bolted bits back together using oversize screws or nuts and bolts. We have designed our own tools for the dismantling of classic Moto Morini V-twin engines. We can now supply these tools for other Morini enthusiasts. An example of the sort of parts we are able to design and fabricate. Our own A35 van was purchased without a heater fitted. Although we were able to obtain the correct model of Smith`s heater it was lacking the air-hose adaptor and some clips. We also needed the air-hose adaptor for the bulkhead where different-size hoses join so we designed and made our own parts. This cherished Mk1 Fiesta was deemed a write-off when hit by a passing lorry. Refusing to have the car scrapped the owner found a suitable donor car and we were able to repair it economically for him.